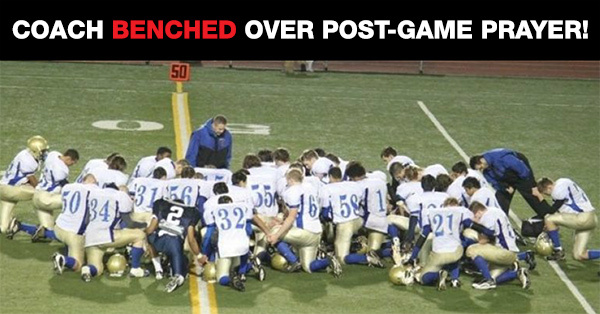 Embattled Bremerton (WA) High School assistant football coach Joe Kennedy continues to face heavy scrutiny. Earlier this season, the school district began investigating the coach for walking to the 50-yard line after each game, taking a knee, and saying a brief prayer, a tradition he had held for the past seven years. After several warnings, Fox News has reported that Kennedy has been placed on temporarily suspended from his coaching duties for what the district believed was a violation of its violating its policy against encouraging religious activity. In the latest Erwin Brothers film Woodlawn, head coach Tandy Geralds finds himself in a similar situation. After a spiritual awakening amongst the football team takes place in 1973, group prayers and other religious activities become the center of a school district investigation and garnered intense pressure from the superintendent. But instead of caving into their demands, Geralds makes a bold move that inspires an entire city. Kennedy has likewise inspired Christians across the nation who are rising up to show their support and to voice their opinion in this battle for religious freedom. Join us in praying for this brave coach and others like him that refuse to comply with heavy-handed restrictions against prayer and public gatherings. You can also send a message with your support of Woodlawn. Check out the theater listing below and be challenged to stand up for your faith!